The rise of various events in Pakistan taking place every now and then have surely got every Pakistani to be actively participating in it with friends and their families. Be it a launch, a food event or a concert, everyone now looks forward to attending such events. But ever seen brands doing more than just setting up a booth or a stall? However, it’s not that we, as Pakistanis, have completely forgotten about keeping our country clean, many individuals and students participate in extracurricular activities organized by their schools and colleges throughout the year where they have to clean up public spaces, voluntarily. And yes, slowly and gradually, by doing just that we can help make a difference! But Ariel Downy has done wonders at KEF 2019 by contributing to personal hygiene! We’re literally amazed! Ariel, at Karachi Eat 2019, stunned everyone with their amazing initiative in Karachi for the first time ever! We loved how it was effective in every way. During Karachi Eat Festival, Ariel Downy had set up a huge booth where they had planned fun-filled activities and giveaways! They had so many activities to keep the visitors hooked. But you know what really grabbed everyone’s attention? Let’s just say that it was literally the highlight of the event! Ariel Downy distributed free, pleasantly scented, white hand towels to all the visitors out there! The handy towels were super convenient considering the fact that one couldn’t find tissues easily. The towels smelled fresh throughout the event! Winner! The proactive team members of Ariel Downy were scattered everywhere at the venue making sure every visitor gets a free hand towel. And not only that, but the team was super active and made sure that they pick up the litter from the ground, ensuring a clean environment. The towels were cutely rolled up and tied with a shocking pink silk ribbon! Utterly cute! This, instead of using tissues and throwing them everywhere. That’s right. No one had to worry about finding tissues and where to throw them as the bins were placed at a distance where people actually had to look for one. So, yes, these towels came really handy! It’s amazing to see such an initiative working towards cleanliness and how the team managed it brilliantly! With such a massive team, who were on their toes the entire time, with everyone noticing how beautifully they had tried to keep the venue clean! It’s about time we, as humans, educate others about keeping the environment clean and litter-free. We’re glad Ariel Pakistan made this possible at such a grand event! Way to go! 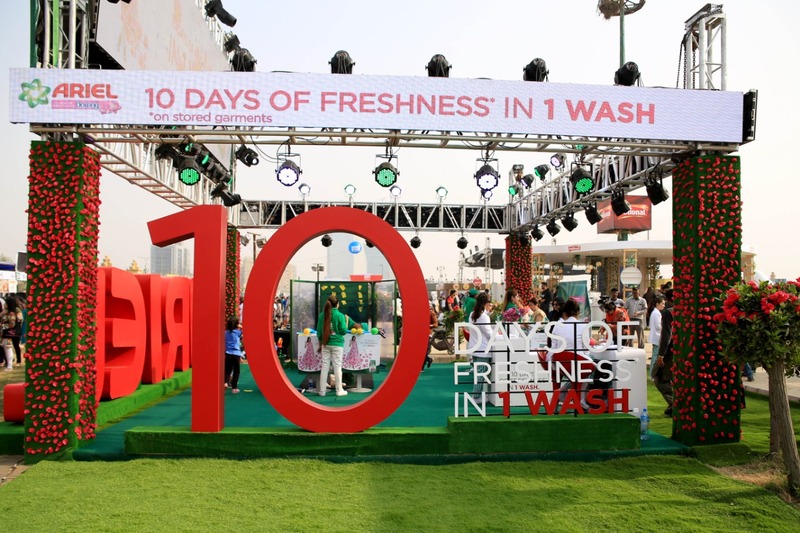 Daily InfoTech: This Amazing Initiative By Ariel Is Winning Hearts Of Every Pakistani For All The Right Reasons!